ECB has announced its Men’s Major Match schedule for 2019, which includes a historic first Test Match at Lord's for Ireland and an Ashes clash between England and Australia. England will welcome the Irish, who made their debut against Pakistan earlier this season, in a four-day contest which will build on last year’s successful Royal London One-Day International series between the two countries, and will be their first ever meeting in the game’s longest and most respected format. 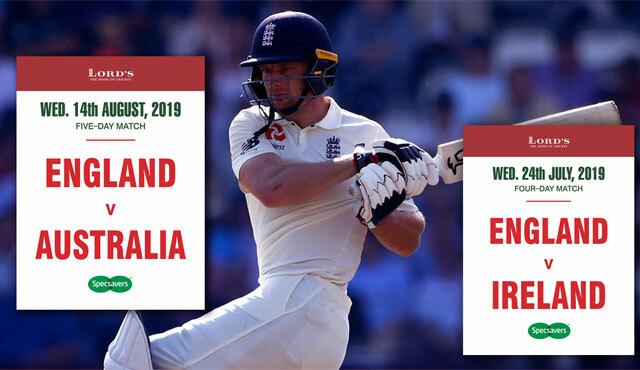 The second Test Match of the summer at the Home of Cricket will see Australia take on England, as the hosts look to regain the Ashes after relinquishing them last winter. The game at Lord’s will follow the opening match of the series at Edgbaston. The showpiece occasions for the domestic men’s game will move to different times in the season to avoid clashing with the ICC Cricket World Cup and the Ashes. Lord’s will once again host the Royal London One-Day Cup Final following the success of this summer’s match which attracted the Ground’s biggest attendance for a domestic final since 2009. The announcement includes confirmation that for the first time, a public ballot will be held for all Specsavers Ashes Test Matches. Each host venue will release tickets via their own public ballot to meet the expected high demand for tickets to watch England’s bid to regain the Ashes. You can register your interest in the Lord's Public Ticket Ballot now. ECB CEO Tom Harrison said: “Next summer’s schedule – with an ICC Cricket World Cup and an Ashes Series at its heart is truly a season to savour for cricket fans of all ages, nationalities and cultures. It is a once-in-a-generation opportunity for us to build an even bigger following for all formats of the game. “There is nothing more important to England cricket fans than an Ashes Series. With the added element of being England’s first Test series in the new World Test Championship, it’s a hugely exciting prospect and we anticipate unprecedented demand for tickets. We would love to see fans from all over the world getting to experience the unique atmosphere of an Ashes Test Match after the ICC Cricket World Cup. “We fully supported the ICC’s decision to award Full Membership to Cricket Ireland and we expect next summer’s inaugural Test Match at Lord’s against our neighbours to be an historic celebration for all Irish cricket fans.